Jonathan & Sarah welcome you to The Lamb Inn in this charming country pub constructed from Cotswold stone located in the picturesque village of Eastcombe. 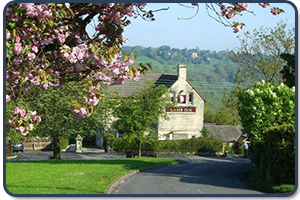 The restaurant is warm and airy; with a traditional yet modern feel; overlooking the spectacular views of the Toadsmoor Valley and stunning Cotswold countryside. The terrace and beer garden are the perfect place to unwind with a favourite tipple whilst taking in the fresh air & views. Enjoy a meal in our restaurant or a light bite in the pub. There is something to cater to every taste. Email not to be used for making reservations. Please telephone.